HMS’ IXXAT Safe, available from CAN Automotion is designed for fast, cost-effective implementation of safe communications solutions in industrial automation devices. With the IXXAT Safe offering, HMS offers an extensive portfolio of solutions for safe communications according to IEC 61508, from safety protocol software to finished safety I/O modules for integration into customer devices. HMS’ safety development team also supports customers in the development of their safety applications, as well as in the certification of end products, offering customer-specific development as OEM solutions. The latest addition to the IXXAT Safe offering, the IXXAT Safe T100 is a complete solution for simple and fast integration of safe I/O using a safe communications protocol. The IXXAT Safe T100 safety module is integrated directly into the customer product or system such as welding systems, drives and counter terminals. Thanks to the comprehensive architecture with safety hardware and software, as well as precertification by TÜV Rheinland, the use of the IXXAT Safe T100 considerably simplifies the development of devices and systems with safe communications. The user also benefits from significant reductions in development time, cost and risk. The IXXAT Safe T100 uses the well-known Anybus CompactCom modules from HMS as a communications pathway through the unsafe network, with safe communications implemented using the ‘black channel’ principle. In addition to the IXXAT Safe T100/PS for PROFIsafe on PROFINET, additional variants will soon be available such as for CIP Safety on EtherNet/IP or Functional Safety over EtherCAT. Custom versions of the IXXAT Safe T100 can also be implemented to meet specific requirements in terms of form factor, connectors, or number of I/Os. 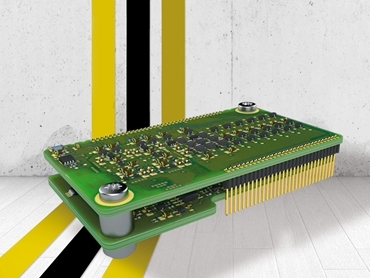 The IXXAT Safe offering also includes protocol stacks for Functional Safety over EtherCAT (FSoE), CIP Safety on EtherNet/IP, CIP Safety on Sercos, and openSAFETY, all precertified by TÜV and permitting the implementation of safe communications in suitable hardware. Integration can be carried out by the device manufacturer themselves, but HMS is ready to assist with implementation, porting, and certification services.